Magnum Boots long awaited Multicam Sidewinder HPi has arrived- and was entirely worth the wait. By MILTECHREV Editor Tom Demerly. Magnum Boots has released their new Sidewinder Combat Desert Multcam HPi boot after initial changes in the delivery schedule. This outstanding boot is worth the wait. The Sidewinder Combat Desert HPi is not an entirely new boot for Magnum Boots. A previous version in solid desert tan has been available and evaluated by over 1456 “testers” in 192 countries according to Magnum Boot’s website. 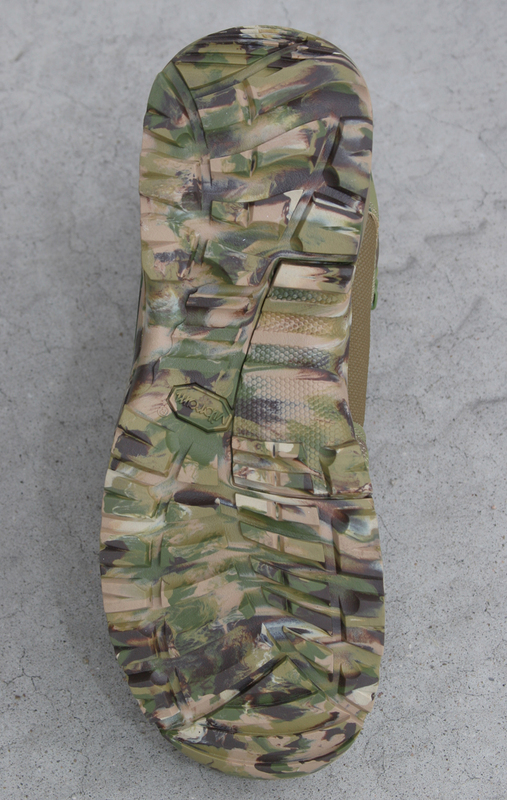 The primary difference with the latest version of the Sidewinder Combat Desert HPi is the Multicam pattern that covers the entire boot, including the sole. This concept of camouflage boots to provide better concealment for the soldier is relatively new but already proving to be effective and popular. This trend in tactical uniforms marks another functional step away from uniforms that were initially designed for garrison wear such as black or solid color boots. The Magnum Boots Sidewinder Combat Desert Multicam HPi is packed with technical details that work together to make this an exceptional tactical boot. The features and benefits range from subtle changes in fabric and design philosophy to more conspicuous changes in the outer design of the boot such as the overall camouflage scheme and the unique fast rope panel on the medial instep area. Three testers wore this boot in size 9.5 US including wear tests while carrying a pack, on technical, rocky desert trails and for long road marches on pavement at speed. We even had the opportunity to do some PT running in this boot. The packaging and the "Magnum Challenge" 60-Day wear guarantee nomenclature when we received production boots. This is the consumer packaging. Ion-Mask: Better Boot Performance in the Real World. A key feature in the Sidewinder Combat Desert Multicam HPi is ion-mask technology. The ion-mask protective layer on the Sidewinder Combat Desert Multicam HPi is an ultra-thin coating layer over a thousand times thinner than a human hair. This coating does not wash or rinse off and is as durable as the material it is applied to. Ion-mask treatment repels water, grit and dust at the fiber level, allowing the fabric to remain breathable and quick drying. It is not a waterproof treatment, but rather, a means of making individual fibers less permiable, more durable and actually improving the breathability and drying speed of the overall fabric made up of the individual ion-mask fibers. Ion-mask even makes stitching on the boot water repellant, making it stronger since it will not soak up water or stretch. Side views of the boot inside and outside. Notice the fast rope device above the instep on the left. The ion-mask treatment on the Sidewinder Combat Desert Multicam HPi effectively moderates overall boot comfort, function and performance in the real world. Ion-mask does not fight the losing battle of trying to keep your feet entirely dry in a wet environment. Instead the design of the Sidewinder Combat Desert Multicam HPi works effectively with the environment to protect feet from blisters, moisture and injury. Your feet can get wet in these boots, but they will dry out faster and remain more comfortable than an entirely waterproof boot. If this idea sounds familiar think back to the original jungle boot from the 1960’s. These boots did not fight the losing battle of keeping water out, but rather, took a more pragmatic approach of controlling ventilation and moisture with boot design. A comparison of relative boot heights for the Lowa Zephyr Desert Boot (left), the Magnum Sidewinder Desert Multicam HPi (center) and the Danner TFX Hot Boot, A-TACS (right). A drawback to waterproof boots is ventilation and breathability. While most waterproof boots use a waterproof/breathable microporous sock liner to prevent water from getting in they tend to be long on water repellancy but short on breathabiltity. Even the best designed waterproof/breathable boots are noticeably warmer than a similar non-waterproof design. The result is, while your feet may not get wet from external moisture like rain or stepping in water, your skin does get moist from perspiration inside the waterproof sockliner of the boot. As your foot perspires your skin become vulnerable to blisters from being wet. Your footwear system is more reliant on your socks and frequent sock changes, not always possible in the tactical environment. The ion-mask treatment on the Sidewinder Combat Desert Multicam HPi prevents the fibers from soaking up water, allowing them to dry faster, provide better ventilation and prevent soaking. 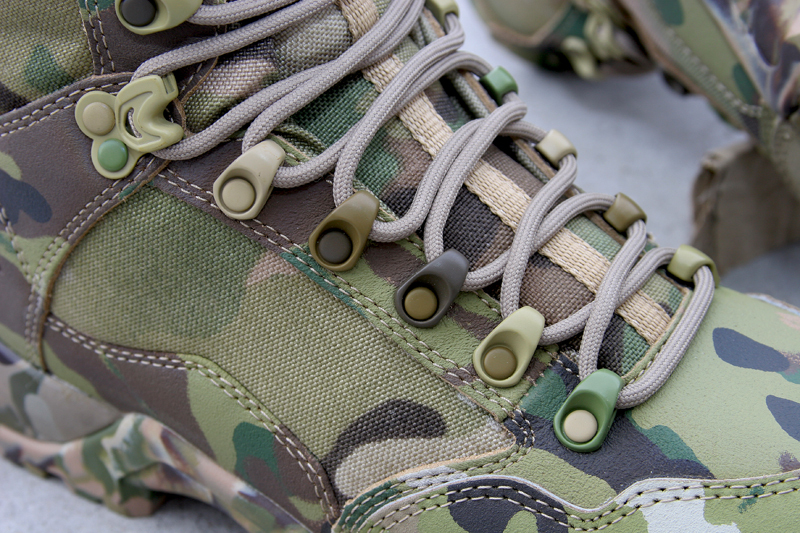 The Multicam color scheme is even executed on the lacing eyelets, a nice detail. Another benefit of the ion-mask treatment is the boot stays cleaner since foreign matter does not stick easily and what may stick cleans off much more easily than non- ion-mask boots. No More Stink: Agion Silver-Based Treatment. Another proven technology built into the Magnum Boots Sidewinder Combat Desert Multicam HPi is the use of Agion anti-microbial treatment to reduce odor. Agion relies on silver ions to reduce the accumulation of smell from the boots. The boots don’t gather bad smells from perspiration. This silver-molecular impregnation has been used successfully in athletic apparel by endurance sports brands like Pearl Izumi (they make bicycling, running and triathlon apparel). For tactical applications it means you can wear your boots on a week long patrol, pack them in your deployment bag and put them on a C-141, fly home, open the bag and not be gassed by the smell of your own boots. The unique design of the heel and toe of the new Vibram outsole improves traction and handling when climbing and when walking downhill. SuperFabric: Making Fabric Boots that Wear Longer. Wear of the boots, especially the fabric sections, is enhanced by using HDM Inc.’s SuperFabric. SuperFabric is a plating technology for increasing fabric abrasion and tear resistance. The earliest versions of fabric boots had the advantages of being cool, lighteweight, quick to break in and functional but they also wore very quickly. SuperFabric armor makes fibers more resistant to abrasion while retaining breathability. Ortholite Insoles: Aftermarket Athletic Shoe Performance. Another fabric/material/design feature on the Magnum Sidewinder Combat Desert Multicam HPi is the use of Ortholite insoles right out of the box- the boots come with them. Ortholite is a brand partner with Nike, Merrell, Timberland, Adidas and New Balance. They do insole/orthotic manufacturing for many of these brands and sell their own line of aftermarket orthotics. The advantage to an Ortholite brand insole is materials, engineering, performance and durability. This is a thicker, more anatomically correct and more durable insole than the generic Cambrelle type insole. The mesh ventilated lining with the Ortholite insole installed (left) and removed (center) and the Ortholite insole removed. Great fabric technologies are no good without good basic footwear design. The Magnum Sidewinder Combat Desert Multicam HPi uses a number of solid design cues to optimize the fabric technologies. Firstly, the boot is an in-between 8.5″ (21.5 cm) height. I’ll argue this is an optimal height for most purposes. It can be donned easily, provides good ankle stability (along with the outsole- more on that in a moment) and retains reasonably light weight. The boot has a padded and scalloped upper collar. The lacing on this boot is superb. Good boots are a matter of details and this boot has attended to the details. 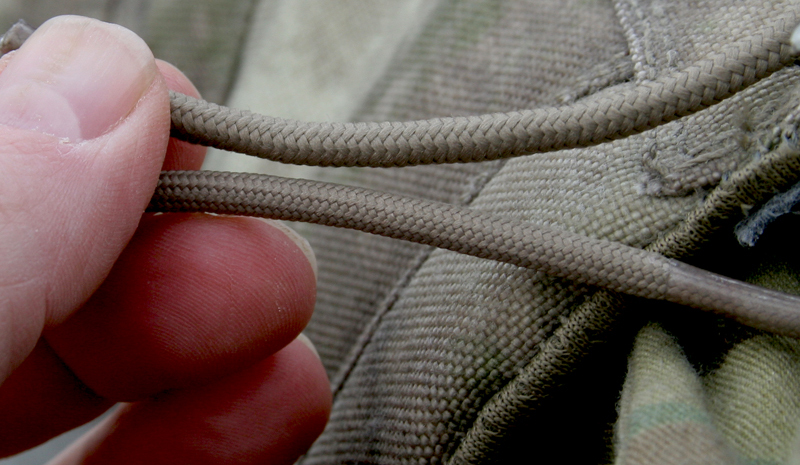 Firstly, the laces: These laces mimmick the feel and weave of .550 parachute cord. The weave of the laces is dense, making them slide through the eyelets more easily and last longer. Before you discount the importance of decent laces consider the awful cotton laces one high end tactical boot supplies their boots with. You have to replace them right out of the box or suffer the consequences in the field. That brand’s boots are great- but the laces are awful. Speaking of lacing, the eyelets on the Sidewinder Combat Desert Multicam HPi also show attention to detail. 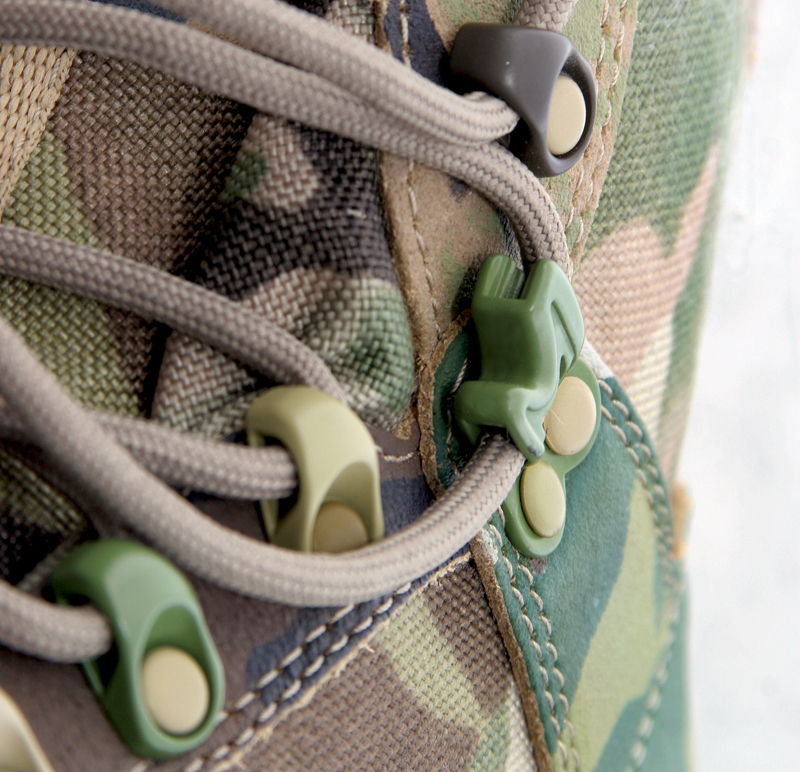 They are Multicam color keyed and the fourth eyelet from the top is a locking eyelet that helps secure the adjustment of the boot tightness when donning. 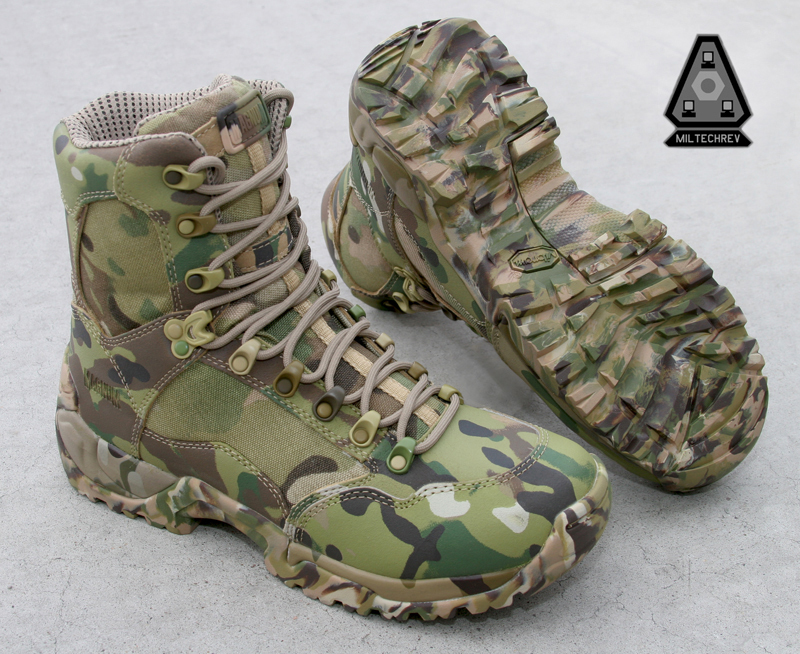 At 787 grams (27.7 ounces) The Sidewinder Combat Desert Multicam HPi is a relatively lightweight boot. The boot lining is perforated and padded adding to both breathability and out-of-the-box comfort. Tongue design integrates with the rest of the upper to prevent debris from entering and folds easily when donning and lacing. We wore several different weight socks during our wear testing and all worked well, even a very light sock-liner worn by itself. Toward the bottom of the boot there is a hefty fast rope panel on the medial instep to help dissipate heat and get a grip on the rope. It also helps with rope climbing. The mid sole is described as dual density molded construction. Given the relatively cushioned feel this technical hiking boot/trail running shoe technology seems right at home on this tactical boot. A thoughtful detail on the lacing system is this locking eyelet that allows intermediate adjustment of how tight the boot is. A particularly nice feature for steep terrain is the radiused-grip heel on the molded Vibram sole. The heel of the boot is partially rounded with a series of grippers molded in. The grippers are angled downward to provide some purchase on the back of the boot if your weight shifts rearward. This is especially important when walking down hill wearing a big ruck. You should already know to keep your weight over the ball of your foot when descending with a ruck on, but this feature is extra insurance if you start to slip or have to descend fast. This technology is borrowed from Vibram’s successful S2V outsoles. These molded, integrated outsoles represent a new direction for Vibram. Even little details like more durable, tighter weave laces (bottom) are included on the Magnum Sidewinder Combat Desert Multicam. The toe portion of the sole wraps upward for better traction. This will also make the boot last longer since a lot of boots die when the toe section of the sole delaminates from upper. 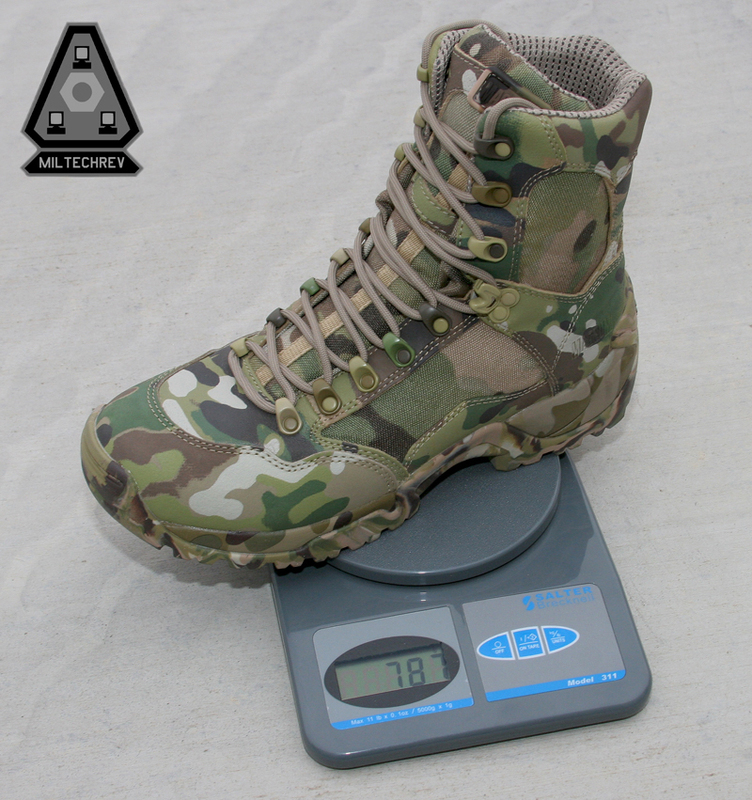 Overall our test boots in size 9.5 US weighed 787 grams or 27.7 ounces (1.73 pounds). Volume in the forefoot and instep/saddle area were spot on for a 9.5 slightly wide foot with average arches. The boots fit well directly from the box. No break in was required. We have been looking forward to this boot for so long that when we finally got them we absolutely beat them. Three testers tag teamed these boots over 2 weeks. They were almost constantly on someone’s feet, almost constantly in motion. When they weren’t marching on pavement they were rucking in the mountains. We hammered them, likely putting 2 months of normal wear for one owner into 2 weeks with three testers sharing one pair. I put 8.5 hard miles on these boots wearing very thin, low socks directly out of the box. No blisters, no hot spots. The boots felt light and agile and provide good shock absoption. My first impression wearing these is the boots ride “high”. The midsole, insole and outsole are thick. I am taller with these on. There is a lot of “cush” to the soles. 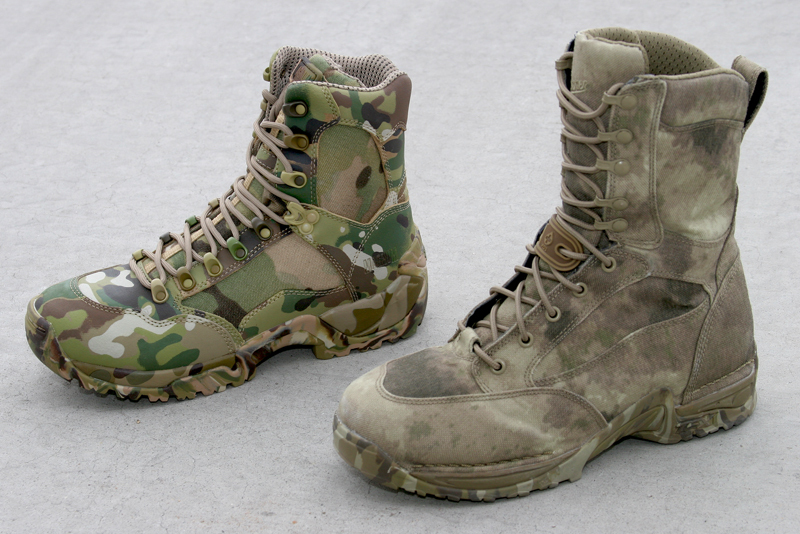 A visual comparison of the Magnum Sidewinder combat Desert Multicam HPi (left) and the Danner TFX Hot Boot, A-TACS (right). Wear testing them in lose terrain on an 8 mile up, 8 mile down technical trail that climbed to 9,000 feet while wearing 25 pounds at the start (got lighter as the tester ate and drank from their hydration reservoir) was equally impressive: no blisters, great stability, handling and excellent traction, especially descending. No hot spots at the ankle or ball of the foot. Laces stayed tied and adjusted. We didn’t get the boots soaking wet or swim with them but we did one rope descent on a static trainer- the grippers on the inside are sticky and grip the rope well if you are light and not wearing a pack. We did pull a pair of swim fins over them and they work well with the little Force Fins. I installed a pair of Grivel Air Tech Light semi-rigid adjustable crampons on these boots and, once adjusted, they worked fine. Clearly there is a lot of versatility with the design of these boots. No review is complete without some criticism and, although any complaint with a boot this nice is about impossible to find we did miss a heel loop to help with donning. Beyond that, we couldn’t find a thing to change. A close look at the Multicam colored outsole. The soles are slightly lighter since soil will cause them to darken slightly with field use. It took a while for the Magnum Sidewinder Combat Desert Multicam HPi to reach the market but they are absolutely worth the wait. Magnum did well to delay the release of the boot until everything- including reasonable supply- was ready for the consumer market. This boot has been extensively tested around the world in several versions and is absolutely proven now. The new Multicam color scheme adds another layer of function and appeal. The Sidewinder Combat Desert Multicam HPi comes with Magnum’s “Magnum Challenge” 60-Day Guarantee: According to the hang tag in the boot box from Magnum, if you are U.S. customer you can return the boots within 60 days for a full refund if they do not work for you. That suggests Magnum has a high degree of confidence in the performance of this boot. Our tests also reinforce a high degree of confidence in this boot. They have excellent out-of-the-box comfort and show almost no wear after hard use. Each of us found the boots comfortable, maneuverable and lightweight. None of us developed blisters or hot spots even on varied terrain across wide temperature ranges using different socks and carrying a load. It’s hard to not be impressed by this boot. They were truly worth the wait. Magnum's new Sidewinder Combat Desert Multicam HPi took some time to hit the market but is absolutely worth the wait. « SHOT Show 2012: Footwear.